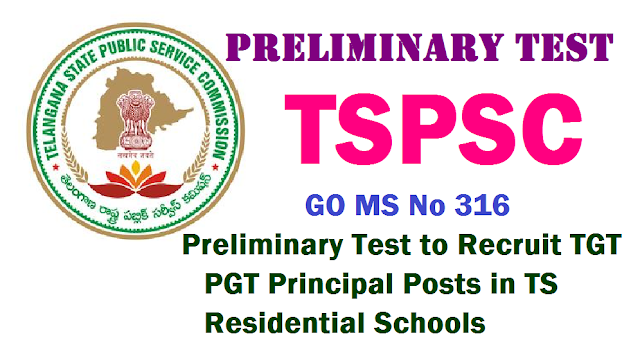 GO MS No 316 TSPSC Preliminary Test to Recruit TGT PGT Principal Posts in TS Residential Schools|Preliminary Test to Recruit TGT PGT Principal Posts in TS Residential Schools by TSPSC|Scheme of Examination Vide GO MS No 299 Dt 30.06.2016 Ammendments | Screening Test will be conducted to eligible candidates for the Recruitment of TGT PGT Principal Posts in Residential School Gurukulas in Telangana State | Telangana State Public Service Commission is going to conduct Screening Test Preliminary Exam prelims for the Recruitment of Trained Graduate Teachers Post Graduate Teachers Principle Posts in TSWREIS BC Welfares residential Schools Minority Welfare Residential Schools TSMWREIS Public Services- Direct Recruitment – Scheme of examination for various categories of posts in Residential Educational Institution Societies – Amendment - Orders- Issued. In the reference 1st read above, orders were issued framing scheme of examination for various categories of posts in Residential Educational Institution Societies to be filled-up by direct recruitment through Telangana State Public Service Commission. In the reference 2nd read above, the Secretary, TSPSC has requested the Government to issue necessary amendments to the G.O. 1st read above by incorporating the words “ Preliminary (Screening Test)” under the Scheme of Examination in respect of (1) Teacher and (2) Principals in order to avoid confusion and to have uniformity in the Scheme of Examination. It is also requested to incorporate the following Para while issuing the amendment to the said order, for clarity regarding “Preliminary (Screening Test)”. “ The Preliminary (Screening Test) is meant for short listing the Number of candidates to be admitted to the Main examination and the marks secured by the Candidates in the Preliminary (Screening Test) will not be counted for the purpose of final selection”.